We are your source for wholesale military patches. With nearly 10,000 different emblems in inventory, you should have no problem finding the military patches you need at wholesale rates. Our categories include Navy submarine, Navy aviation, Navy ship, Navy station, Navy rating, Navy Seabee, Army special operations, Army division, Army field artillery, Army infantry, Army ratings, Army unit, and select Air Force wholesale patches. We have been in the business of military patches for three generations and more than 30 years. Our founder Don McGrogan’s passion for military patch collecting began during his time in the Navy. 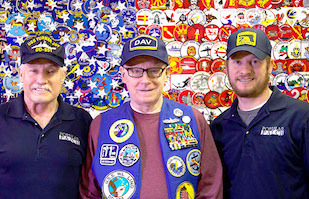 After retiring a Senior Chief E8 his passion as a military patch collector grew into a family run business. Now it is our mission to honor our fellow veterans and preserve these emblems of our American history. Please note that a resellers permit is required to become a wholesaler. If your request is approved you will be able to visit the site (www.popularpatch.com) view your wholesale pricing and complete check out for all your orders. As a wholesaler all orders over $100 in total will include free shipping. All orders below $100 in total have an additional shipping and handling fee. This fee will vary between $3.50 and $11.50 depending on the number of patches ordered. Would you like to send a patch directly to your customer? No problem, as a wholesale partner our website allows you to create a drop shipment straight to your customers. Simply place the order as usual on the site, change the ship to address to your customers address, and check the "Drop Ship" box... Boom! A dropship order has been created. Dropship orders include a packing slip which shows the order details but does not include any pricing. On the packing slip, your name will show as the sender. All drop ship envelopes are a blank envelope that shows your address as the ship from. Again- simply change your ship to address during checkout, check the drop ship box and you have created a drop shipment! It couldn’t be easier! Use the contact form below to request more info.